Horse riding in Eastern Europe offers a whole new world. It is not only that the horse riding holidays there are exceptional value for money as the economies catch up with Western Europe, but there has long been a tradition of horsemanship in large parts of Eastern Europe. Hungarian carriage driving, the Lippizaners in Romania and Polish hunting traditions represent the more visible part of this riding tradition in Eastern Europe. You are likely to find a working blacksmith and forge in most villages. Horses and horse riding are understood and welcomed by everyone, so finding places to overnight with your horse is not a problem. There is minimal development and a varied countryside through which riders can ride freely without encountering large roads on their holiday. While we have horse riding holidays for all abilities in Eastern Europe, good riders will get the most out of the riding here with far more choice and the opportunity to make the riding holiday as challenging as they like. But the best part of this horseman's paradise is that the tourism industry is not very developed yet. Visitors may be an object of curiosity and are received with warm hospitality. Local people are eager to demonstrate the best of their country and region from nature reserves to historic buildings and cultural traditions long suppressed under Soviet rule. There are many relics of the Soviet era: collective farms, Soviet style socialism traditions and buildings. Many stories of life behind the iron curtain come to life over a drink or around the campfire. This is absolutely fascinating - visit now before it all disappears! Read our article on Eastern Europe. Once you have ridden this trail you will feel like you have really got to know Bulgaria and its people. 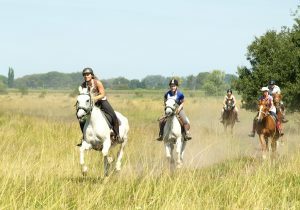 Ride across the central Balkan Mountains on good horses. Transfer: 2019: Included from meeting point according to time of last arriving/earliest departing guest. Flights should be booked to arrive before 18:00 and departure after 12:00 on return. Other times can be arranged for a fee of €150 per car (1-3 pax) each way, payable on site. Approximate transfer time is 3 hours. Exciting riding on super horses through the scenic Bulgarian mountains steeped in Thracian and Roman history with relaxing and indulgent spa treatments in the evenings. There is a choice of three different levels of accommodation based on budget: luxury with spa, more basic hotels with shared bathrooms on some nights or camping with facilities. Meeting point: Sofia Airport (SOF) by 12 noon on Day 1. A ride on good horses exploring the high mountains of central Bulgaria with a focus on nature. Enjoy mountain scenery in this hospitable country which has a tradition of excellent horsemanship. The riding is at all paces where the terrain permits on responsive, fit horses. For good riders. Ride through villages surrounded by the towering Rhodopes Mountains and visit Bulgaria's second largest monastery, the Bachkovo Monastery. There is a choice of three different levels of accommodation: simple guest houses with great character and a warm welcome or a budget option which includes 3 nights camping. Standard accommodation: 13 - 20 July; 10 - 17 August. Standard accommodation with 3 nights camping: 27 July - 3 August; 24 - 31 August. Explore the secluded Dalmatian countryside of Croatia on this budget-busting break for experienced riders. Enjoy delicious homemade food and wine, fast, thrilling riding and friendly hosts at this based stay where you'll be welcomed as one of the family. 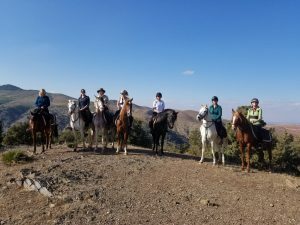 We expect this ride to become one of our most popular breaks, combining breathtaking mountain scenery, trustworthy horses and sincere Croatian hospitality. 2019: 6* (full), 20* April; 05, 18 May; 8, 22 June, 6, 20 July; 3, 17, 31 August; 14 (full), 28 September; 12, 26 October, 2, 11 November. Other dates available on request. Meeting point: Split Airport (SPU), Croatia. Flights can arrive and depart at any time. Riding Ability Required: Intermediate and above. Must be confident at all paces including gallop. Transfer: 2019: Return transfer from Split airport, bus or train station is €50 per person payable on-site in cash. A revitalising ride through the beautiful Istrian peninsula, taking in the best of the stunning landscapes and cultural history. Based stay with daily rides across the plains on lovely fit and responsive horses. Comfortable accommodation with ensuite double bedrooms and an onsite 'swimming pond'. Transfer: 2019: €60 return per person from Budapest Airport or town (pick-up between 1pm to 6pm. Transfers outside of these times will incur an additional fee). Payable on site. Transfer time is approximately 1 hour 20 minutes.